Speculative fiction writer Tad Williams has sold over 30 million copies of his books, which have been translated into more than 25 languages. His first epic fantasy trilogy, “Memory, Sorrow, and Thorn”, became an international bestselling series beloved by millions. And now Tad Williams returns to the world of “Memory, Sorrow and Thorn” with a new sequel series called “The Last King of Osten Ard”, a series which seems likely to catapult him back once more onto the bestseller lists. We talked with Williams shortly after he and his wife and business partner Deborah Beale announced that he had just completed the rough draft of the first book in the new series, The Witchwood Crown. In this exclusive interview, we asked Williams some questions about his world-building, plans for book tours, what it’s like to return to a world he hasn’t been to in ages, and his plans to continue to write “Bobby Dollar” books in between Osten Ard novels. Below is Part One of the interview. Further portions of the interview will be published later this week. OstenArd.com: Thanks, Tad, for agreeing to do this interview! You have stated that you are writing the new Osten Ard novels at the same time as Bobby Dollar stories. Even though they are very different stories, do you ever find yourself confusing the characters’ voices? Or are they just too different for that to happen? Tad Williams: One of the nicest things about Bobby Dollar is that I tell it in the first person. Once I start writing that voice, it comes pretty naturally (in part because he talks more than a bit like me.) Most of TLK is third-person past tense (there are some epistolary sections in first-person present) so it’s actually quite different. Not to mention that BD is modern in style of speech, so it’s like turning off the tape-delay. When I’m writing fantasy, especially pre-industrial fantasy, I have to find a proper tone and vocabulary to go with the story. But with TLK, I just have to come up with something that feels appropriate to what I used in the first books. 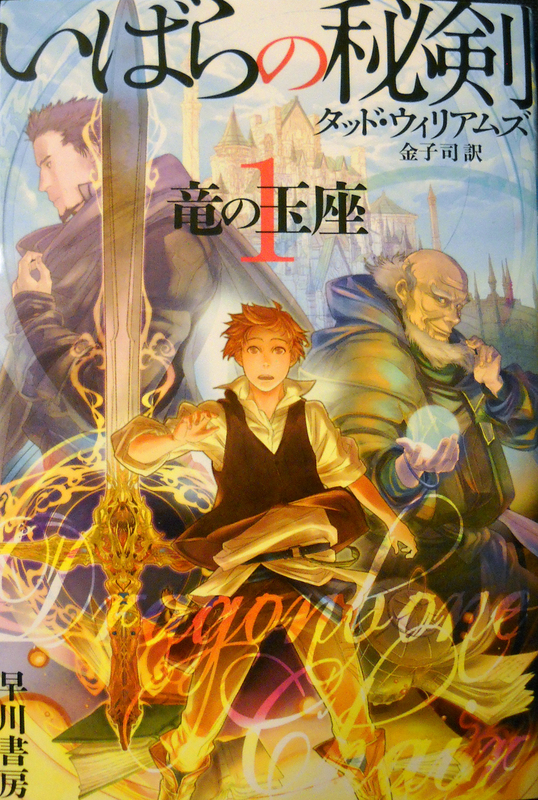 Cover of part 1 of the Japanese edition of The Dragonbone Chair, one of more than 25 translations of the book. OA.com: You have a devoted fan base who would love to meet you. Does your publisher plan a major book tour before/during/after the launch of The Witchwood Crown, and if so, where might you go? Are there markets that you absolutely know you’ll have to visit? Tad: I hope so, and I would love to do it. Publishers haven’t been touring writers as much because of a) the loss of profitability in brick-and-mortar publishing and the 2006-present economic ructions. But I hope this is enough of an event to warrant my American publishers touring me again. As far as other countries, that’s always catch as catch can, although I’m pretty sure my German publishers will tour me. OA.com: Both Christopher Paolini and George R. R. Martin have acknowledged that you inspired them to write their own series. Are there plans afoot to ask them to provide a blurb for The Witchwood Crown? Tad: Christopher would probably do it, no problem. It’s always hard to get George to do stuff like that just because there’s so many demands on his time. He’s like me times a thousand, probably, in terms of how many things he can pay attention to out of however many are seeking his attention. Map of Osten Ard, showing the more than a dozen nations which make up the continent. OA.com: In The Dragonbone Chair, you built a massive world with more than 100 cities, towns and villages spread out over a continent. Then you created languages, cultures, and peoples to fill those places. As you added more books, Osten Ard grew further. Are you planning to do any exploring of areas outside the old maps? The “blank areas at the edges of the maps”? If so, how will that mesh with the existing infrastructure and the old maps? Tad: There will definitely be some expansion of what we know about O. Ard., but I’ve got plenty of stuff from the originals to elucidate and expand upon without going beyond the Nascadu desert or the northern Trollfells or Nornfells. However, we will learn a bit more about the -conceptual- map of the world, and also see some places we never saw in the first books, that’s for sure. OA.com: During the events of MS&T, readers got to explore the realm, visiting everything from steaming jungles to frozen tundra (LOTS of frozen tundra!). Any plans to revisit areas of Osten Ard which didn’t get much attention in the classic series? Nascadu? The Hyrkalands? The Westerling Islands? Harcha and Naraxi? Ijsgard? The Lost Garden? Tad: We’re going to see a LOT of the Nornfells and Nakkiga. 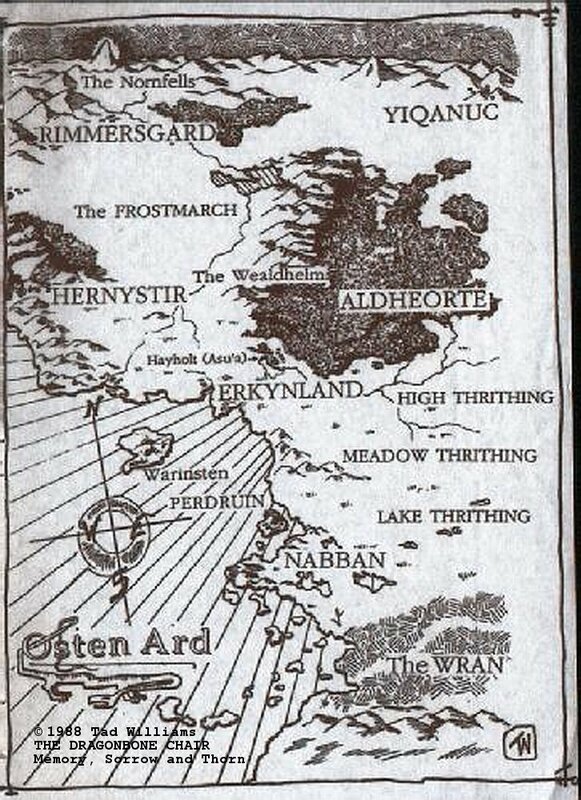 We’re also going to see a lot of Aldheorte and the Thrithings and Nabban. As far as other, previously unvisited places, I’m not sure — that will depend on where the second volume and the beginning of the third takes some characters whose steps I haven’t completely mapped yet. (By the way, the amusingly stupid spellchecker on this email keeps trying to change “the Thrithings” to “the Thrashings”.) And we will learn and hear more about the Lost Garden as well — a LOT about the early history of the Norns and Sithi, both in Osten Ard and before. So while I can’t say we’re going to visit the Lost Garden — it is lost, after all — we’re definitely going to learn and hear more about it. Bestselling international fantasy/sci-fi author Tad Williams was set to complete the first draft of The Witchwood Crown on Tuesday, his wife and business partner, Deborah Beale, announced on Twitter on Tuesday morning. The Witchwood Crown is the first volume of “The Last King of Osten Ard”, a sequel trilogy to the original classic epic fantasy series “Memory, Sorrow and Thorn”, set thirty years after the original books. Beale and Williams have kept fans up to date on a regular basis (a list of monthly page counts can be found here), with news of progress happening nearly every week. 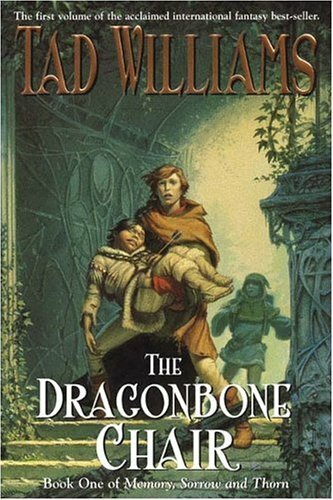 Cover of The Dragonbone Chair, the first volume of “Memory, Sorrow and Thorn”. Reaction to the news of a new Osten Ard series has been very positive, with Daniel Kaszor of The National Post writing, “The Memory, Sorrow and Thorn series […] redefined what traditional fantasy could be. Williams took the basics of Tolkien, deconstructed the story and put it back together in his own image, one fit for modern times.” Kaszor also points out the influences that “Memory, Sorrow and Thorn” had on “Game of Thrones”. Meanwhile, Charlie Jane Anders of io9.com writes that “it’s great news that Williams is returning to the series that made his name”. “The Witchwood Crown” is expected to be published in Spring 2016, and will be followed by Empire of Grass and The Navigator’s Children. The books will be illustrated by Michael Whelan, who painted the original covers of “Memory, Sorrow and Thorn”.